Lift Labs spoon: Google X buys health startup to help with Parkinson's, tremors (VIDEO). 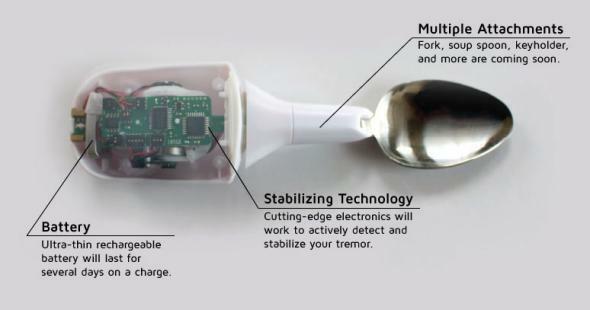 Lift Labs’ spoon is specially designed for people with hand tremors. Google has taken a break from buying robots, drones, and artificial-intelligence companies to acquire Lift Labs, a small startup that makes spoons. As you can see in the video below, Lift’s spoons are not your ordinary flatware. They’re designed for people whose hands shake, whether from essential tremor or a neurodegenerative disorder such as Parkinson’s. Embedded in their oversized handles is an electronic system that senses the tremors and responds with counter-movements designed to keep the spoons’ business ends relatively stable. The handle moves, but the business end stays relatively stable, so the food doesn’t fall off on its way to your mouth. The Lift Labs spoon costs $295 and you can buy it here. The company is also working on soup spoon, fork, and key holder versions. Cool, right? But what does that have to do with Google? Well, as Reuters’ Alexei Oreskovic points out, Google has been taking a greater interest in health technology lately, and Lift will be joining a growing Life Sciences group within the company. That group, profiled recently in the Wall Street Journal, is working on a “smart contact lens” that monitors glucose levels for diabetics. Google also led a $130 million investment earlier this year in a startup that produces cancer treatment software. More broadly, Google appears to believe that some of the same computing technologies it has developed to organize the Internet could be used to make better sense of the human body. Last year it launched a whole new company called Calico with the goal of fighting old age. But there’s another, more personal reason why Google might have been attracted to Lift Labs in particular. Sergey Brin’s mother was diagnosed with Parkinson’s, and Brin himself carries a gene that’s associated with the disease. In 2010, Wired’s Thomas Goetz wrote about Brin’s quest to harness software and computing power to help find a cure for Parkinson’s. Their tremor-canceling device could improve quality of life for millions of people. We’re also going to explore how their technology could be used in other ways to improve the understanding and management of neurodegenerative diseases such as Parkinson’s disease and essential tremor.